One of my favorite movies for sentimental reasons. It starts on Christmas Eve 1944. Bob Wallace (Bing Crosby) and Phil Davis (Danny Kaye) are performing a show for their fellow solders. When the group is attacked Phil saves Bob's life. Back at the hospital Phil convinces Bob to perform together once the war is over. A few years later they are the hottest duo in America. They travel all over the country and are extremely popular. They receive a letter from a platoon mate saying they need to see his sisters perform. They go to see the performance of Betty and Judy Haynes (Rosemary Clooney and Vera-Ellen) and Phil wants them to join their show. They follow the girls to the Vermont where they are next scheduled to perform. When they arrive in Vermont it is unseasonably warm and the inn is deserted. They also learn that the inn is owned by their former commander, General Thomas Waverly. The group comes up with a great plan to put on their show and bring in all the men who also served under the General to save the inn. However, as they are rehearsing love rears its head and threatens to break up the group. Can the performance be saved? This movie means a lot to me. 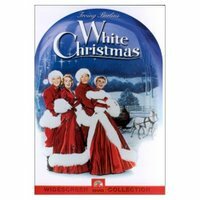 My mom loved old movie musicals and White Christmas was my grandma's favorite Christmas song. The song and dance numbers are very well done and we are treated to Bing's velvety voice many times. Rosemary Clooney and Vera-Ellen were both wonderful as the Haynes sisters and Danny Kaye is funny as always. It is a movie that needs to be watched every Christmas season.